One of the biggest concerns people have about real food and healing diets is money: is it possible to do GAPS on a budget? I’m here to tell you YES! As I mentioned in my post about affording essential oils, my husband and I don’t make a ton a money. However, we budget carefully, make a few sacrifices, and put a high value on health and healing. And it turns out we can do it. We can afford for me to be on the GAPS Intro Diet without much concern. It takes some research and careful planning. 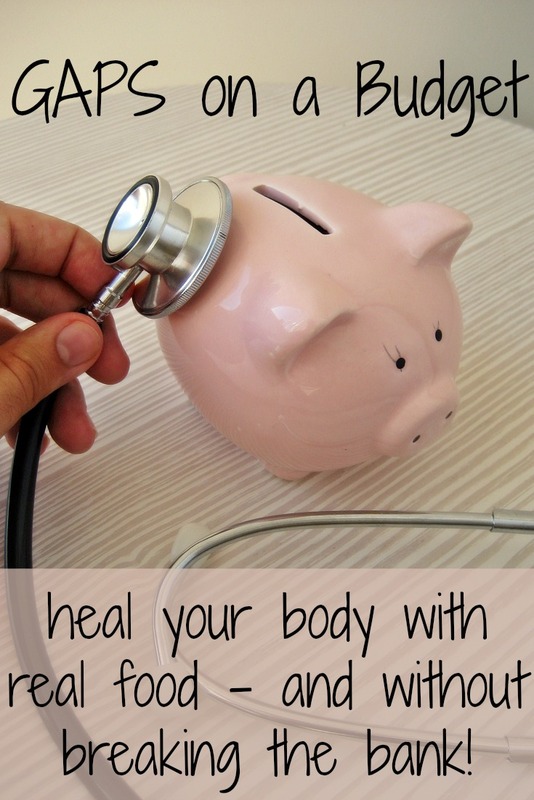 But I promise you, with a little bit of work, you too can afford to heal your body. How much does GAPS cost? How much GAPS costs your family relative to your current budget will completely depend on what you are spending now. Do you eat out a lot, or do you cook all your meals at home, stretching them with grains and beans? Is your kitchen full of specialty paleo items, or do you only eat simple meals? If you eat out and cook with paleo flours, GAPS will greatly reduce your food budget. No doubt about it! GAPS Intro does not allow for eating out, so you will save a lot of money over pricey restaurant prices. You are also restricted, at least at the beginning, to only meats, vegetables, and animal fats. No longer spending money on pricey specialty items will give your budget some breathing room. On the other hand, if you are already a real foodie, making everything from scratch, eating grains and beans, and already working to keep your spending low, you will find that your food budget must increase. Meats and vegetables are more expensive than beans. But the good news is that they are also much more nutrient dense and healing, so you may be able to eat less. This is where we started from, and our spending on food did increase slightly. But only slightly! The most recent soup I made only cost about $1.40/serving. Even when you add in eggs, extra fats, seasoning, etc., it is still less than $2/serving. Not bad! Oh, and it was made entirely from grass fed meats and almost entirely from organic vegetables. How does that compare to what you spend per meal now? And of course, prices will vary based on where you live. In the heart of the Midwest, food prices and general cost of living is much lower than on the coasts. 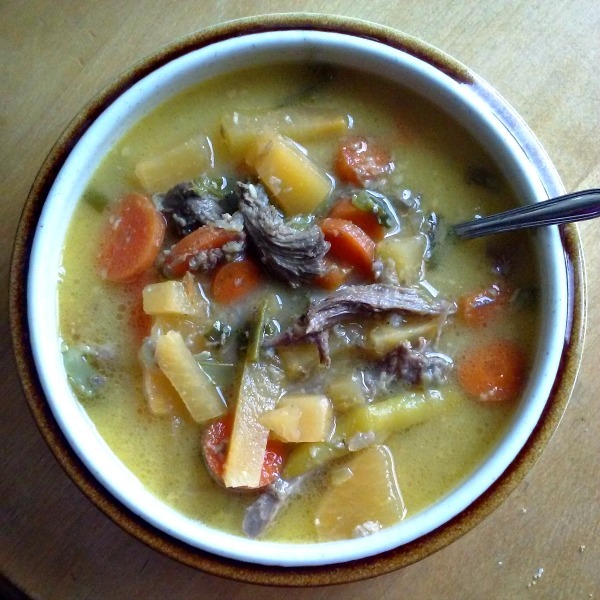 This is a delicious, filling and healing soup made with grass fed beef bones, lamb heart, and four types of vegetables – for only $1.40 per serving! Americans want food to be cheap. We don’t seem to understand that someone needs to pay for it. Most other countries spend significantly more on food than we do. We are used to food that is cheap – both in cost and in nutrition. It takes a mindset change to be okay with paying more for better food when you first make the transition. If there is no room in your budget, what can you cut down on? Do you have a gym membership you aren’t using? Do you really need to buy more clothing? Why not get rid of cable and use that time for walks and preparing GAPS dishes? Ditch toxic cleaning and personal care products in favor of extremely frugal, natural ones. When on a healing diet, you won’t be going out to eat and you may be able to reduce medications and supplements (always talk to your doctor first, though!). Your health will greatly improve. You may be able to work more (if you wish). How will these things affect your budget in the long run? Do they create room for more food? Again, I discuss thoroughly in my affording essential oils post how we have managed to prioritize health and find the money to nurture our bodies and heal them. Like us, you may feel like there is nothing more to cut out to make room. But really think about it. Then move on to the next section: how to get the best food for your buck. 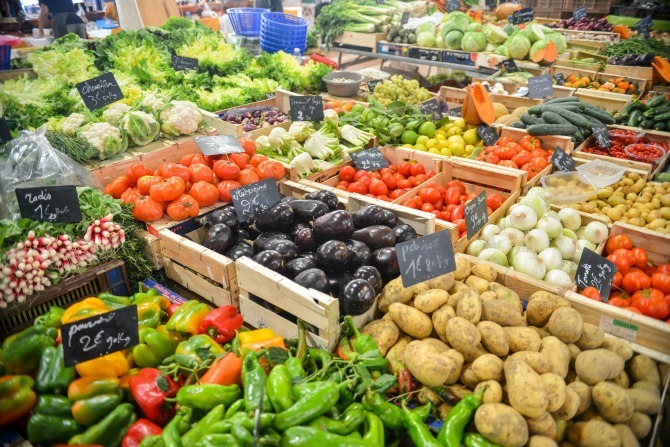 Food Sourcing is a huge factor in both your food budget and the success of your healing diet. In a perfect world, we would all eat a wide variety of 100% grass-fed and pastured meats and organic produce. It would be a wonderful, beautiful thing. But then we wouldn’t be sick and having this conversation, now would we? 1. Shop around. Visit a few different grocery stores and determine which generally have the best prices for things. Write down or remember where you can get what. Sweet Potatoes and Social Change has a good post about this. Select 2-3 stores that you can visit; if you try to go to too many, you will waste more money on gas than you save on food. For example, we get most of our produce and our chickens from Costco. We get our fruit and avocados from Aldi. 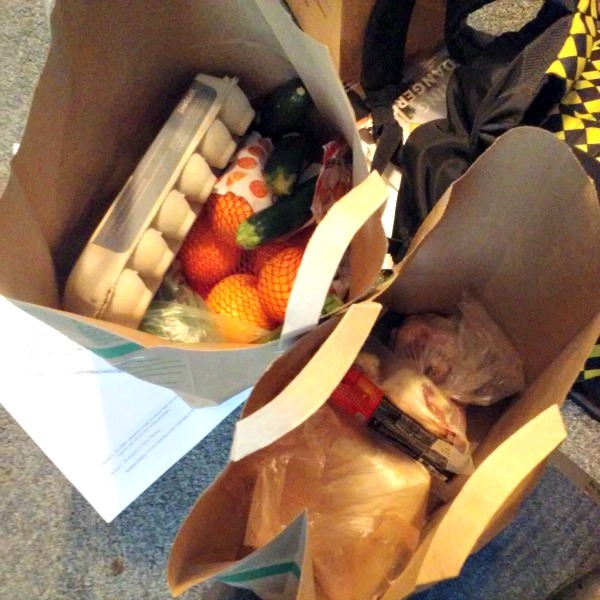 We get our eggs and a few other vegetables from either a grocery store we can walk to or the local co-op, depending on what we need. 2. Find a farm. In addition to the grocery stores above, we get all of our meat (except chickens) and lard from a local farm. It has a monthly drop off one parking lot over from my husband’s work, so he just pops out for 10 minutes during his shift to pick up all our meat for the month. We found them by searching Eat Wild, and they had the best prices for the items we wanted. 3. Find the cheaper cuts, and be okay with less variety. We eat a lot of whole chicken ($2.50/lb), soup bones ($3/lb), ground pork ($4.50/lb), and organ meat ($2-3/lb; try lamb heart, it is very mild) for our meat. We eat a lot of eggs ($4/dozen, which is equivalent to about $4/lb). I do buy organic butter ($4/lb) to make ghee with, but I try to use lard that I render myself ($1/lb) as my primary fat. Those prices are for 100% grass-fed, pastured, non-GMO, humanely raised, etc. animal products. My vegetables are organic carrots ($0.70/lb), rutabaga ($0.99/lb), squash, and organic frozen green beans, broccoli, and peas (varies, all less than $2/lb). I don’t spend more than $1 each on my beloved avocados. I usually stock up when they are on sale for $0.59 each at Aldi, and I only eat half of one a day. Yes, it means I eat the same thing a lot and I can’t eat some of my favorites. But I still get a variety and many intensely healing foods. 4. Buy in Bulk. Shopping at Costco, bulk bins online or at co-ops, and buying shares of an animal from a farm are all great ways to save money by buying in bulk. Shop around to determine if there are options available in your area that will save you money. Just keep in mind that you should not buy more than you can consume before it spoils. 5. Grow a garden. I live in the north Midwest. I know gardens are not an option most of the year! But an herb garden on your window sill can save lots of money throughout the winter, and a prolific summer garden will be a boon for your budget. It not only will significantly reduce your food budget in the summer, while allowing for a wide variety of organic vegetables. 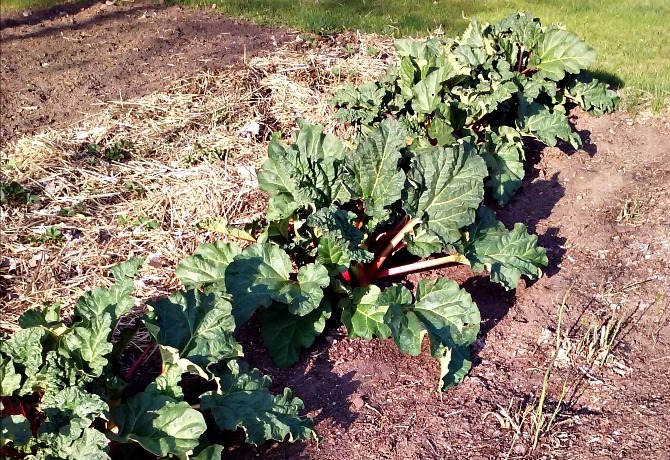 You can then preserve any extra harvest to help keep budgets down the rest of the year. 6. Use every bit of food. Food waste is a huge no-no when on a budget! And the food news is that with a healing diet, using all the scraps is often called for! For example, my healing Creamy Chicken Soup uses all the meat, organs, and soft tissues from a whole chicken. Then everything else can be used to make healing and filling bone broth. Freeze extras and make sure to keep an eye on how long something has been in the refrigerator so that you can cook it up before it goes bad. Scraps should be saved for making broth, soup, and stir fries. Use egg whites, juicer pulp, apple peels, fat that drains off of meat, and other “leftovers” to make more food. When all else fails, make compost. Reducing food waste means your family is getting more calories and more nutrients for the same amount of money. 1. Animal fats. The higher quality your fats, the better. This means pastured lard, grass-fed tallow and butter, high fat cuts of meat, etc. These are my quality priority, and are thankfully some of the cheapest to find. Yes, if you try to buy high quality lard from the store, it’ll take a chunk out of your pocket! However, I am able to buy pork fat from my local farm for just $1/lb that I then render myself. I get gorgeous high quality lard for cooking and consuming, plus an amazing snack in the form of pork cracklings. All for just $1/lb! Note: all other fats purchased should be extremely high quality as well, such as extra virgin olive oil as opposed to GMO seed oils. However, animal fats take precedence in our budget because they are so much cheaper. 2. Other animal products. You are what what you eat eats. The main problem with produce is often pesticides. These of course are not good, but they can be worked around in many cases (more on that later). However, animals are storing the toxins they eat, and any other junk they accumulate while living unhealthy lives, in their fats and tissues. That is much harder to avoid. Your best bet is to go with lean meats, but that is still not idea. We only get 100% grass fed and finished beef and pastured, antibiotic-free, non-GMO fed pork and chicken. It costs more, but it tastes better and is much more healing. To offset the costs, we get the cheaper cuts as mentioned above and look for sales. Our local farm also offers amazing prices relative to any grocery stores, which allows us to stick to a meat budget of $5/lb quite easily. For more on how to prioritize meat, check out The Paleo Mom’s post. 3. The Dirty Dozen. Next up, we only buy organic versions of foods on the dirty dozen list. Good news for sugar and nightshade sensitive GAPSters like me! I don’t actually eat very many of the foods on this list. The ones that I do are easy to find frozen at Costco and/or we grow in our garden. If it is not on the list, but is actually cheaper to get organic, we do that, too. And this does happen! Organic carrots from Costco and organic zucchini from our local co-op are cheaper than conventional at our other stores. For other foods we love that are not on the dirty dozen list, like winter squash and rutabaga, we simply buy conventional. And thankfully avocados on the Clean Fifteen list, so I don’t worry about that at all. Our produce budget caps out at $2/lb, and this type of prioritizing gives us a decent amount of variety. Whew! Lots of information in this post. I sure hope you learned something! If nothing else, take away this: You can heal your body. You have the power, and money should not be an obstacle. You can make this work. You can do GAPS on a budget. Great tips! I love that you included that if people eat out a lot GAPS is actually cheaper because I have found that to be true too. Great post! Those are great tips for just eating healthier in general, even if you aren’t on GAPS! Thank you! I’m doing a lot of writing for GAPS now, but I hope people on all types of real food diets can benefit from the tips. This is very helpful, Chloe. I remember being terribly overwhelmed by the cost. The longer we were on GAPS the more our health improved so we definitely saved in the long run. But buying in bulk is critical when embracing this whole food diet. I’m glad you were able to stick with it and save money! Buying in bulk has definitely helped us. This is really helpful, especially to those of us who are on a tight budget. I really appreciate all of your GAPS posts. I love to see budget posts like this because it really makes these diet changes less overwhelming. Great post. Thank you! That is what I am aiming for! This is such a great post. Cost is such an obstacle to healthy eating for so many people. All of these tips really make it easier. Thank you! I’m glad they help. I have had too many people say they can’t afford to eat real food.